Still moody (or rather, in holiday mood) when drawing this caricature. Drew halfway, went to play DragonBall Z Budokai Tenkaichi 3 with my son, then back to colour it. Took longer than usual to complete it. 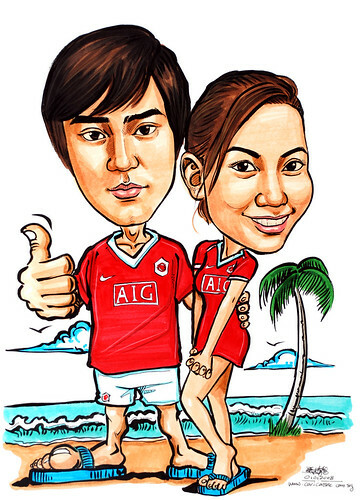 The client wanted them to be dressed in Manchester United jerseys, but not in soccer boots. He wanted to be more of a fan instead of a ManU soccer player. I have both of them in slippers, given that he needed a beach setting.